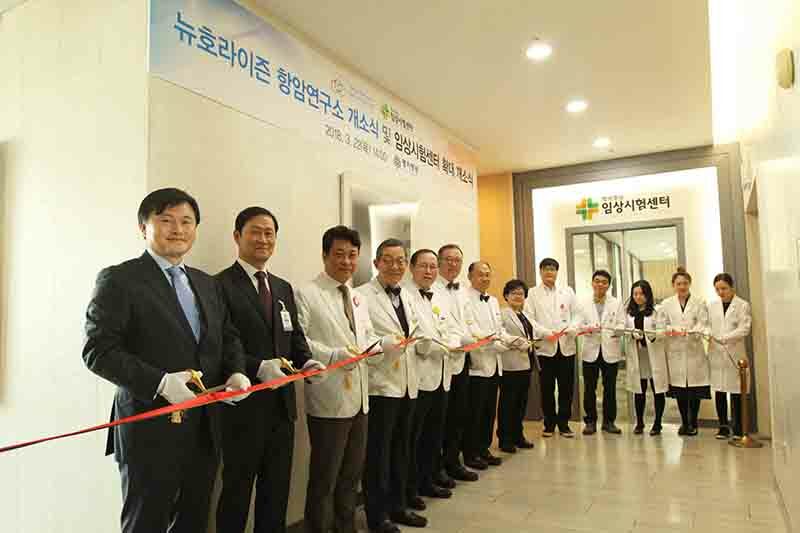 Lee Wang-jun (third from left), chairman of Myongji Hospital, cuts tape to celebrate the opening of New Horizon Cancer Institute, at the hospital in Goyang on Thursday. Myongji Hospital and Cancer Rop, a biotech firm formerly known as MGMed, celebrated the opening of a new research institute to boost clinical trials and fight cancer, at the hospital’s grand hall on Thursday. Equipped with a smart lab and animal experiment rooms, the new research institute will play a pivotal role to carry out local and global clinical trials on various anticancer treatments and combination therapies using oncolytic viruses, the hospital said. New Horizon aims to facilitate the competitiveness of Cancer Rop, which has been leading molecular diagnostic techniques that can check numerical and structural abnormalities of chromosomes accurately and quickly. The biotech firm recently secured molecular diagnostic techniques for chromosomal microarray and whole-genome amplification. Also, the company became the second-largest shareholder of Oxford Cancer Biomarkers, a UK-based developer of medical tests, and expanded the business area into colon cancer. By acquiring Oxford Vacmedix, Cancer Rop also obtained pipelines for immunotherapies and diagnostic kits. The various pipelines will be crucial in pushing the research institute’s future projects, observers said. New Horizon Cancer Institute said it planned to use Cancer Rop’s existing techniques to introduce new technologies and build platforms to link between drug developers, ventures, hospitals, and investors. The research institute will verify technologies based on Cancer Rop’s Recombinant Overlapping Peptide (ROP) techniques, conduct toxicity testing, and clinical safety evaluations of drug efficacy. New Horizon will also develop immunotherapies, stem cell treatments, next-generation sequencing (NGS) techniques, and biomarkers, with “open innovation strategy.” The strategy refers to collaboration among various players to generate pools of ideas. “By building a platform, the research institute aims to become a link between new drug developers, venture firms, hospitals, and investors. To differentiate from other existing labs, our institute will provide advice and initiate research plans, beyond physicians-led clinical trials,” said Lee Yoon, head of New Horizon Cancer Institute. After the opening ceremony, Theragen Etex Vice Chairman Kim Seong-jin gave a keynote speech to share “the latest knowledge of cancer treatment through TGF-β signal regulators."